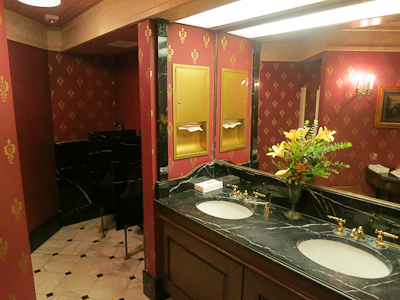 Back in Part 1 I told you all about getting into the club, dinner, Fantasmic!, and the restroom. Now we’re on to dessert. It’s dotted with raspberry stuff–SIGN ME UP! I didn’t bother going outside for these. I missed the audio, but I was still enjoying my meal and after the break we took for Fantasmic!, it really was time to enjoy the meal. Plus, you see that nearly empty wine glass in the forefront? Tragic. At this point we realized that other people were taking pictures inside the restaurant, so as gauche as it may have seemed at the time, we just went ahead and took pictures. Starting with asking the server to take a picture of us. Not our best shot. Also, no more wine. Sad. 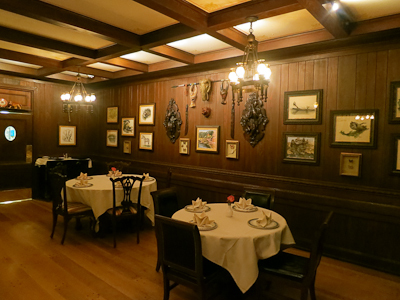 I made Kevin take pictures of the dining room because he’s a better photographer than I am. 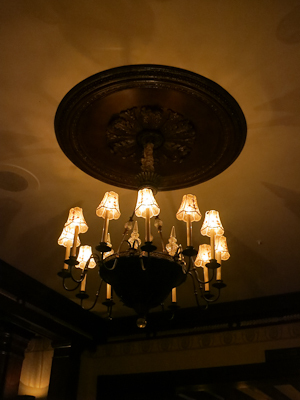 I want this lighting fixture. Yes I do. 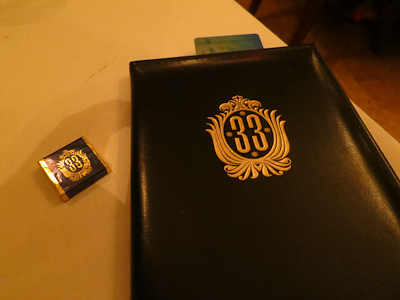 Our bill arrived in a lovely Club 33 bill holder thingy. I totally wanted to steal this one too, but that would have been way obvious. Back in the day, you got a commemorative matchbook with your meal. Now you get this. 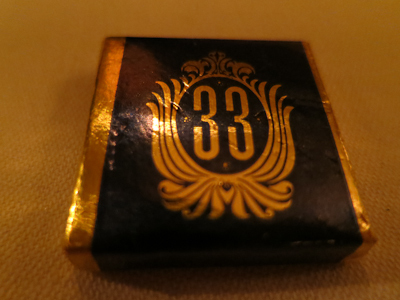 I was all excited about this chocolate until I bit into it. It’s mint chocolate. Just an FYI. I hate mint chocolate. It makes the chocolate taste cold. So that was a bit unpleasant, unfortunately. He has more class than I do. Which apparently isn’t hard. 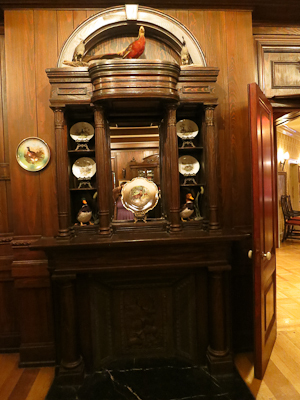 It was awesome just looking around at all the details of the club. 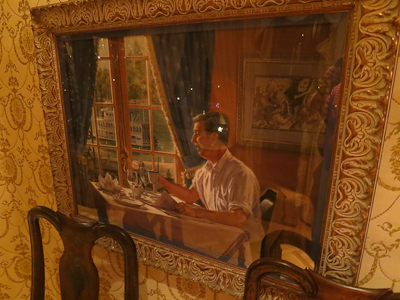 Walt eating at Club 33? Actually he died before he ever got the chance. 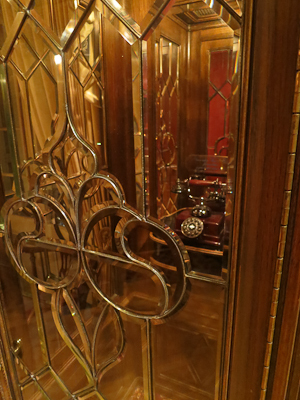 There was a telephone booth. I forgot to ask if the phone actually worked. 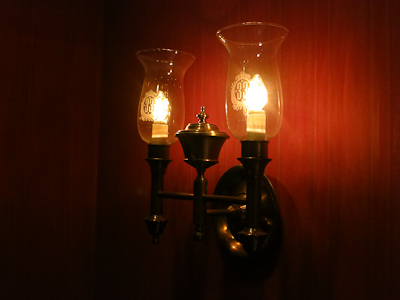 Actually I recently broke a sconce at the cabin. I think this would be the perfect replacement, don’t you? 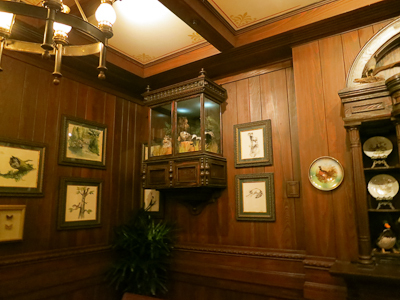 There’s also another room to Club 33, the Trophy Room. It’s pretty gorgeous. This vulture was the start of it all. 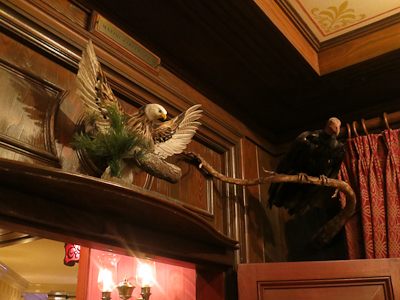 It was actually intended by Walt to be an audioanimatronic bird like those in the Tiki Room, to listen in on people’s conversations and then respond. Because how bizarre would that be? And by bizarre I mean awesome. 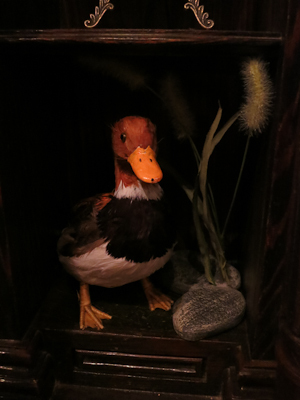 This duck, as far as I know, is completely innocuous. This amazing buffet, and the lone table of people eating in the room. That was awkward. But finally, we could drag our feet no longer. 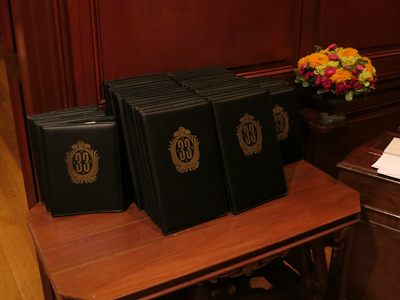 There’s a set of Club 33 merchandise you can buy and I was DESPERATELY hoping to get Club 33 mouse ears, but the cast member said that they had completely sold out. Instead we got a commemorative wine glass and a keychain. All in all, it was truly a magical night. What an amazing experience, with an amazing meal. I am so thankful to my reader (I don’t know if she wishes to be identified or not :)) for giving us this opportunity of the ultimate date night. 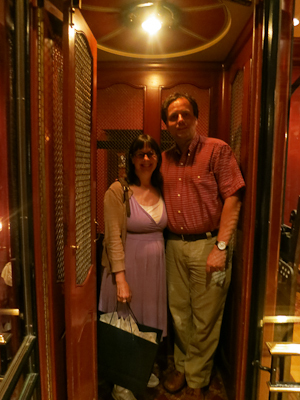 Did we want to take the elevator downstairs? 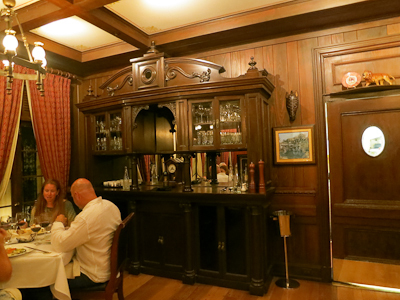 The table that lone part was sitting at in the trophy room is the table we sat at! I’ve heard the phone in the booth does in fact work, though I didn’t try it out myself. I also totally agree that the food is as outstanding as most say it is! 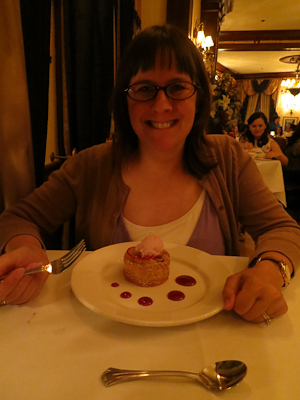 I’m not a fancy food person, normally, but that was the best meal I’ve had. 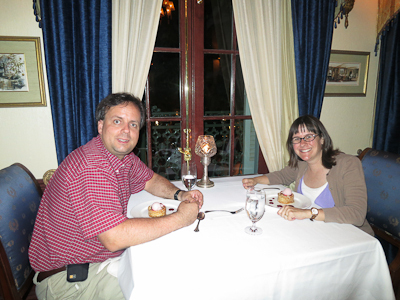 You two seemed to fully enjoy yourselves, which is how an experience like this should be! That’s so cool! It’s a gorgeous room. I would have loved to have eaten in there too. And yes, we tried to make every minute count :). Wow. That place is gorgeous. 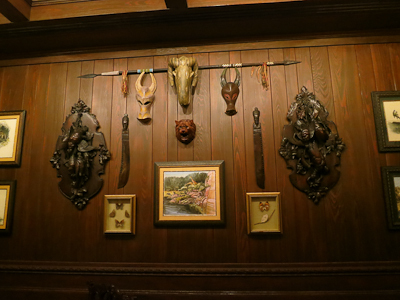 And I would totally want the Club 33 ears. Right??? I asked my reader if she ever came across them, to pick me up a pair, but I suspect they’re a pretty hot commodity. I mean, that’s even more awesome than Theo’s first haircut ears. Well, maybe not. But still. 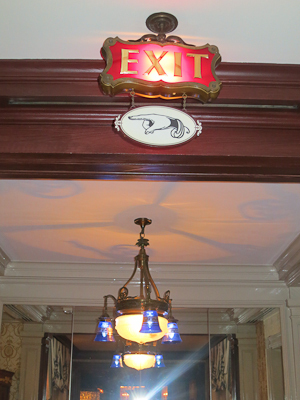 Not only am I completely excited to see you back and posting, but what a neat trip to Club 33! I get such a kick out of seeing folks surrounding the door, getting their picture taken, hovering to see if anyone comes in or out… How exciting that you were able to experience Famtasmic! 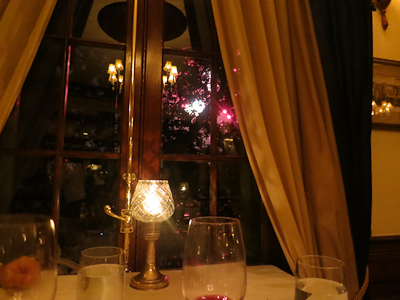 and the fireworks show from that elite viewing point as well. Just awesome. It was completely awesome all the way around :). Although we got the cheap cheap cheap passes and can’t get into Disneyland for several weeks now, so there won’t be any posts immediately forthcoming unless you want to read about my kids’ birthday parties :D.